Students looking to save money on textbooks can now rent select McGraw-Hill Education titles through a pay-as-you-go service from iFlipd. 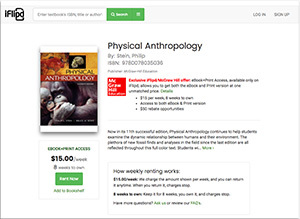 The textbooks are available in both print and e-book formats for $15 a week; after eight weeks, students can opt to own the print copy or receive a $50 rebate. Or, students can simply pay for the weeks when a textbook is needed and return it when they are done. If students rent an e-book for at least eight weeks and don't order the print book, they receive continued access to the e-book and a $50 rebate. If students rent both the e-book and the print book for at least eight weeks, they receive continued access to the e-book and own the print book. If students return a print book to McGraw-Hill Education, they receive a $50 rebate. While select McGraw-Hill Education textbooks are available for the $15 per week rental, all other print titles from the publisher are also available for regular weekly rental through iFlipd. For more information, visit the iFlipd site.